2013 Kawasaki Brute Force 300. Picture credits - Kawasaki. Submit more pictures. The Brute Force� 300 offers strong utility and sporting capabilities in a compact and surprisingly affordable package. 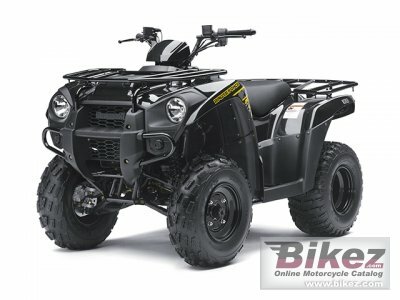 Here�s an all-around sport utility ATV that�s not only loads of fun to ride, but also delivers a high degree of strength, practicality and everyday versatility when there is work to be done. Whether you�re mending fences on the ranch, plowing snow or trail-blazing with the family, this ATV exceeds the rider�s expectations. Price as new (MSRP): US$ 4249. Prices depend on country, taxes, accessories, etc. Ask questions Join the 13 Kawasaki Brute Force 300 discussion group or the general Kawasaki discussion group. Rate motorcycles you know and help your fellow riders to find the bike that is right for them. Bikez has the most users and the most extensive motorcycle rating on the net. It includes reliability, design, engine performance, accident risk, repair cost, offroad capabilities, racing track capabilities and touring capabilities. The ratings are also used to rank the 100 most popular MC models each year since 1990. The lists	are adjusted weekly as new ratings are added. You can check out the rating of the 2013 Kawasaki Brute Force 300 and compare it to other bikes here.